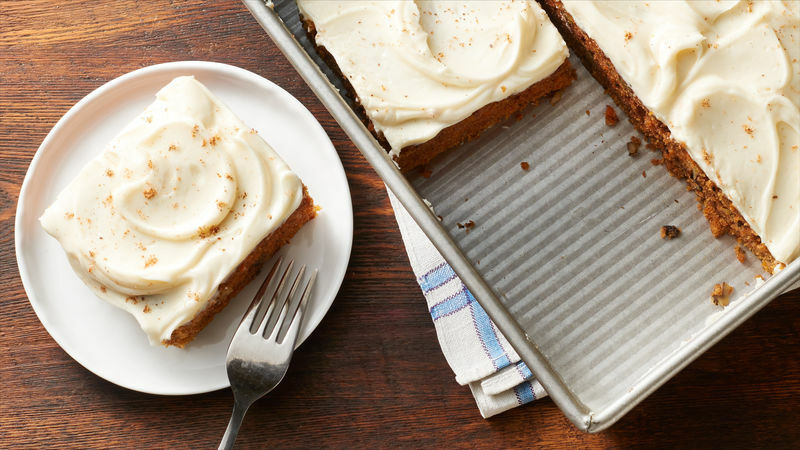 Stir in a good dose of grated fresh orange peel and fresh gingerroot—both play up the sweet earthiness of the carrots and brighten the richness of the cake and frosting. A thick cream cheese frosting is the go-to finish for carrot cake, but for a lighter approach why not bake the cake up as muffins or a loaf cake? Glaze with an orange icing: mix powdered sugar with a few teaspoons of fresh orange juice and a little grated zest until the right consistency for drizzling off the tip of a spoon. Some people aren’t nut fans, so if you leave them out consider adding some golden raisins or snipped apricots. Or if walnuts aren’t a favorite, try toasted pine nuts or even salted pepitas (hulled pumpkin seeds); both offer a contrasting texture without infusing a strong nut flavor into the cake. Save yourself time by using a 16-ounce container of Betty Crocker Rich & Creamy cream cheese frosting instead of the from-scratch recipe. Greasing and flouring cake pans for this kind of dense, moist cake is your most important first step (after properly pre-heating your oven.) Especially if you want to unmold cake rounds to stack. Generously grease (the recipe call for shortening, but really any fat works well) the pans, then spoon a couple of teaspoons of flour in—tap the pan back and forth or in a circular motion so the flour just lightly coats the surface. Tap out any excess. But to be doubly sure you can remove layers in one piece, line the bottom of the just-greased pans with a circle of waxed or parchment paper. Treat this as an after school snacking cake—pour the batter into two square 8-inch baking pans. Bake them up, making one unfrosted cake available for the kids right away, allowing them to frost or ice their own pieces as they go. Stash the second cake in the freezer until you need it. According to food historians, carrot cake is probably a variation of the carrot puddings that were popular in Medieval Europe. Since sugar and other sweeteners were precious at that time, enterprising cooks used the naturally sweet root vegetable as delicious substitute sweetener in many versions of a simple carrot cake recipe. As legend has it, George Washington celebrated the British evacuation in 1783 with a slice of carrot tea cake at Fraunces Tavern in lower Manhattan. Some things haven’t changed: Not only is carrot cake still popular, but the restaurant is still in business. While some version of a carrot cake recipe can be found going to many centuries, the addition of cream cheese frosting seems to be a uniquely American innovation that began to appear in the 1960s. To keep the tradition going in your own kitchen, consider trying other versions of carrot cake recipes that feature clever plays on classic flavors.